The Samsung Galaxy S9/S9+ are the first high-end mobile phone flagships in the Android camp of 2018 and is also the starting point for Qualcomm's flagship mobile processor, the New Year's Goods Snapdragon 845. 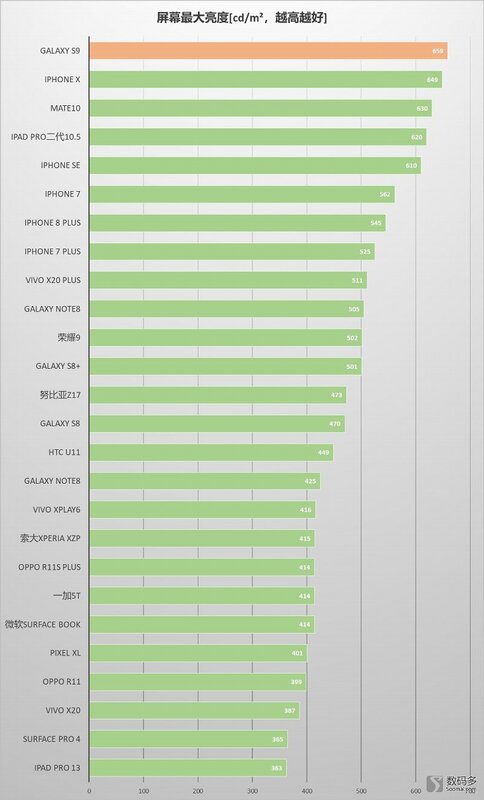 Due to the outstanding performance of the Galaxy S8 series in the global market last year, and Samsung itself as the leader in the display panel industry, emerging applications such as HDR entertainment, mobile AR and VR are increasingly popular, allowing consumers and manufacturers to expect higher display performance and technical requirements for the S9. Galaxy S9 uses a Samsung dual-curved flexible AMOLED display screen, 5.8-inch, 2960x1440 resolution, screen ratio of 18.5:9, the screen accounted for about 84%. If you visually compare it with S8, except the 1mm thinner of screen bottom edge and the position of the front sensor, the two models have little difference in frontal vision. The fingerprint identification area on the back of S9 is placed below the camera rather than S8¡¯s right side. The screen sub-pixels of the Galaxy S9 still use the diamond-pixels diamond Pentile pixel arrangement. Compared to AMOLED panels provided for customers such as Apple, OPPO, vivo, etc., Samsung's technical work on its own mobile phones should be paid more effort. For example, AMOLED panels of Galaxy S8, Note 8, and S9 have adopted new packaging technologies, and the number of physical glass layers has decreased. For example, when the iPhone X is viewed from a certain angle, the screen overall tone will be discolored due to the extra touch layer, while the S9 has no such problem. Technical specifications such as color, brightness, etc., Galaxy S9 in the impact of higher display standards, in addition to UHD Alliance certification, S9 brightness compared to S8 increased at least 20%, in addition to support for standard HDR10 video playback, S9 It also adds independent brightness management to the picture browsing, so that it can display the brightness advantage better when displaying ordinary pictures. 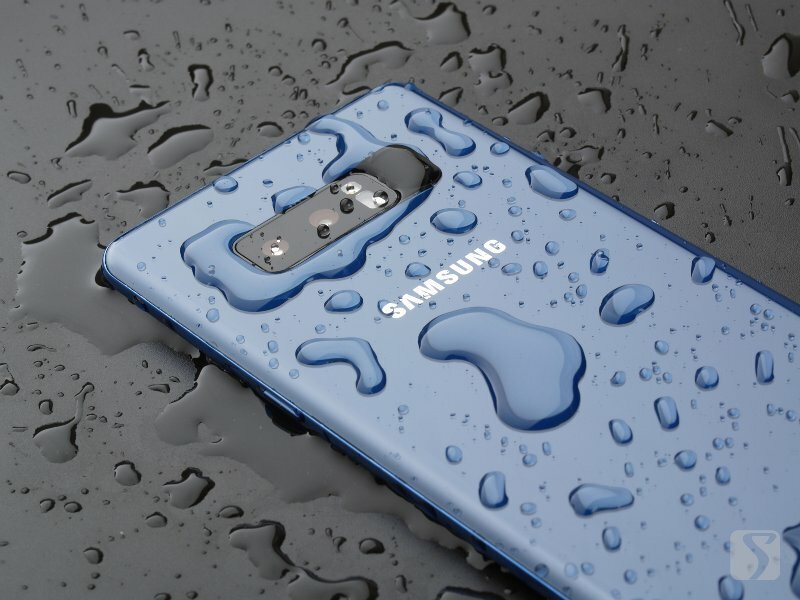 Galaxy S9 runs on Android 8.1, the display settings are still the four modes provided by Samsung 4, adaptive [NTSC], AMOLED theater [P3], AMOLED photos [Adobe RGB] and the basic [sRGB], which are four most commonly used Digital color standards, users can choose according to their own tastes and standards. 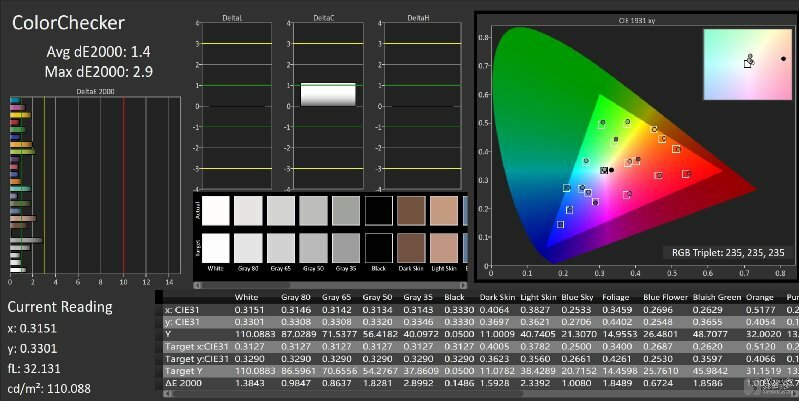 The next step is to evaluate the S9's objective indicators such as color and grayscale. If there is no special explanation, the indicators are the test results of the SDR's standard dynamic range display mode. Max Screen Brightness (cd/m2 or nits): The maximum brightness one screen could reach, without considering glass quality, algorithm or dynamic adjusting. Over 500 cd/m2 can be used under strong light, below 400 cd/m2 will be to use. 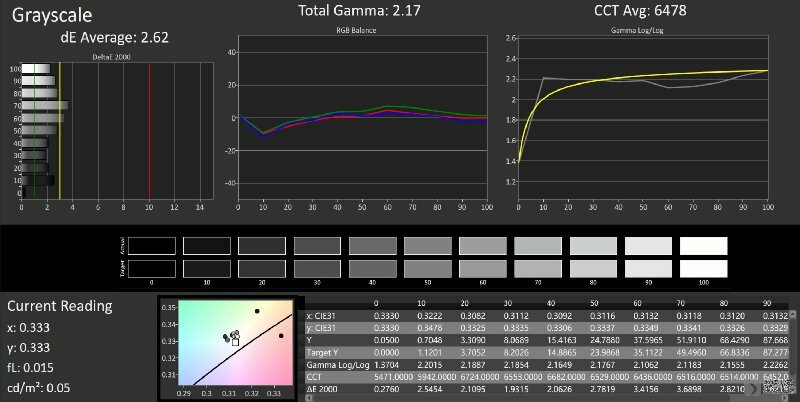 Gamma 2.2: Gamma value is the key factor in contrast display. Our eyes do not perceive light the way cameras do. Under sRGB, if the gamma value is 2.2, the tonal range is just what human eyes receive. Lower than 2.2, the contrast will go down, otherwise, it will go up. Except the gamma value, we have to see form the picture if the red, green and blue curve overlap, if not, different color contrast will be different. The value between 2.1 to 2.3 is qualified for display, while if the value is below 2 or over 2.4, the contrast will be lower or higher than standard. Average Color of White: The average color temperature in degrees, D65 with 6500 K is the standard color of White for most Consumer Content and needed for accurate color reproduction of all images. Higher than 6500K will tend to be cold, otherwise will be warm. Color difference: A measurement used to indicate how much a color deviates from standard. The higher the ¦¤E, the more inaccurate the color. This is because the human eye is only capable of detecting color difference at certain thresholds. It is hard to detect if average ¦¤E is below 5, less than average 3 ¦¤E and less than 5 ¦¤E is excellent, the smaller the ¦¤E is, the better the color is. Between 5 to 10 ¦¤E is detectable, over 10¦¤E is significantly detectable. Color Gamut(sRGB): The specific range of colors that one device is able to display. Our test is based on sRGB. 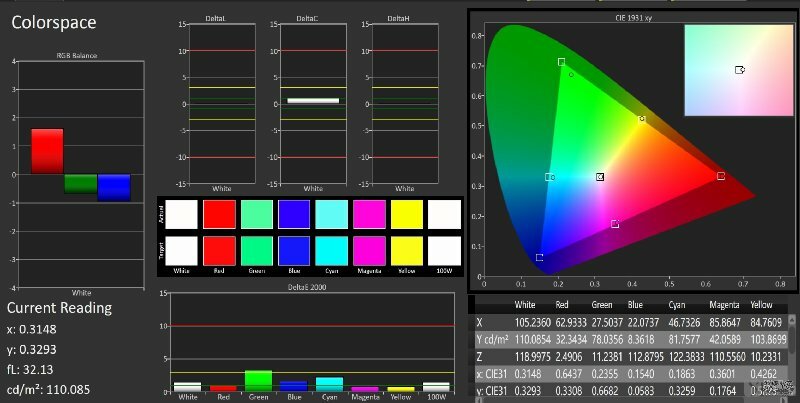 If wide-gamut device is tested, Adobe RGB or NTSC gamut will be noted for reference. Display with over 90% will be enough for everyday use, higher than a certain percentage will not affect using experience significantly. However, photo playback requires precisely range, 10bit video requires wider gamut. Restricted by our devices, we will not test the viewing angle. On average, more than 30 would bring over 50% brightness loss. In terms of grayscale and color accuracy, the Galaxy S9 has made significant progress comparing with last year's flagship S8/S8+ and Note8. The preset cinema mode and sRGB mode have significantly better color dynamics, and the color temperature is closer to the D65 standard 6500K. The overall gamma value is also closer to the SDR 2.2 standard. At least when displaying the same picture, the reference of color and contrast is improved compared to S8+ and Note8 in our hands. For the display consistency and the edge color of the curved screen, the gray-level error value of the upper and lower areas of the S9 is negligible. The dispersion control of the S9 in the curved part is better than that of the S8. In the all-white background, the curved part is mainly only relatively darker, red-green shifting is not obvious. In outdoor use performance, the S9's automatic maximum brightness is 659 nits, and the peak brightness is close to 1100 nits [when the screen highlight area is less than 40%]. Compared to the S8/S8+ with a peak brightness of more than 700 nits, it has increased by more than 20%. In the HDR video and outdoor experience, the S9 has achieved the best in mobile phones. In applications such as Gear VR and AR, which rely more on-screen performance, high brightness and richer colors also have important values. In addition, the system pre-set in the AMOLED theater mode, S9 can display the color coverage has far exceeded the standard P3 color gamut, covering 76% of the BT.2020 ultra-wide color gamut, which is also the highest level among mass produced smartphones, for HDR content and 10bit deep video, color gamut is also more the better. On the whole, Samsung¡¯s control of the entire industry chain and its technical capabilities have made the Galaxy S9's screen color, brightness, and overall performance surpass all previous models of the Galaxy models, surpassing all competitors and becoming the benchmark of the new industry. 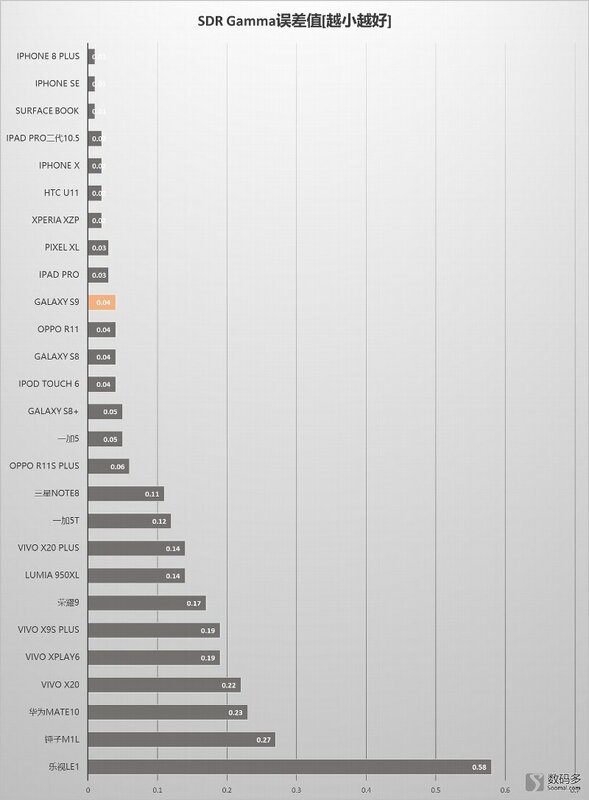 It also gave a good start to the high-end mobile phone market in 2018. Compared with the iPhone X, the S9's objective indicators such as grayscale and color consistency may not be as close to "perfect" as the iPhone X, and the lack of color saturation in the AMOLED photo mode, but it is already excellent enough.